London, UK, 25th April 2017, Mark Roberts Motion Control Ltd., industry leaders in moving camera robotics receives the highly prestigious Queen’s Award for Enterprise: International Trade 2017. Mark Roberts Motion Control specialises in precision motion and control of camera movement for a wide variety of applications, from sports broadcast to feature film and commercial visual effects. The committed and dedicated team designs and creates solutions that have seen the company’s export sales and brand reputation substantially increase year on year – with 2017 on target for another record high. “This is Britain’s highest business award and it is a great honour to receive. Our company is among the lucky few businesses to achieve the UK’s highest trade accolade. 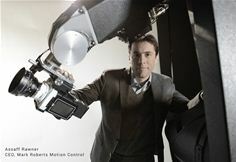 Mark Roberts Motion Control has won numerous awards for its company’s achievements and engineering skill, including an Academy Award. It now has the honour of the Queen’s Award. Today, MRMC has a global presence and was recently acquired by Nikon, the Japanese multi-national corporation, who for many years has worked closely with MRMC developing imaging related technology.